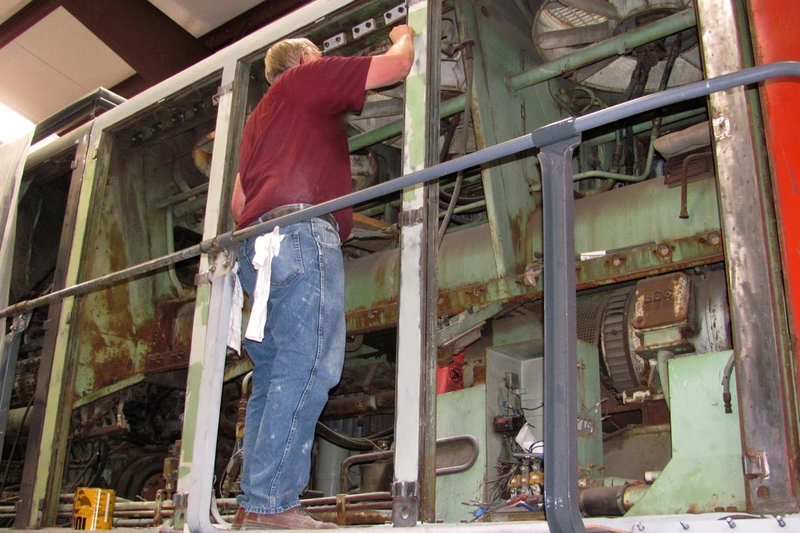 The Diesel Locomotive Maintenance group handles maintenance and repairs of nine operating NCRy diesel locomotives including an NW-2, SW900, F7, GP7, GP9 and SD9 all manufactured by EMD, an Alco S-6 and two GE centercabs. Our group tends to routine maintenance of the diesels locomotives. Daily maintenance reports filled out by operating crews often list items needing attention. If a component is not working correctly or is broken, our task is to correct the problem. Work on the diesels often requires working in tight quarters on, in and under the engines. Work conditions are sometimes noisy and often oily and dirty, but satisfying. Some of the things we do: fueling, checking and adding lubricants, cleaning diesel engines, adjusting brakes, replacing worn or out-dated parts, general troubleshooting and completing annual maintenance checks. Our group is also responsible for switching cars to position them for maintenance and to assemble various operating train consists. Diesels: Mechanical ability, understanding of electrical systems, plumbing knowledge. Qualified brakeman for switching operations. We generally work on on Tuesdays and Thursdays, but if an important project is underway we do work additional days.